Back in October 2016, Microsoft altered the Dynamics 365 Licensing. This product was formerly known as Microsoft Dynamics CRM. We still offer Dynamics CRM licensing on our hosted platform. The aim of this page is to offer clear information about Microsoft Dynamics 365 licensing following the updates from Microsoft in March 2018. There are several options, which are priced at different levels, and we want to ensure you choose the right one, potentially saving your organization money! Licensing Microsoft Dynamics 365 can seem complicated but we hope that we will inform you and give you great information, save you money if you have been misinformed, or ensure that you are within the Microsoft rules about licensing. We have been speaking with organisations that have ‘under licensed’ and therefore could be fined if they were to receive an audit by Microsoft, so ensuring you are getting this right is absolutely crucial and something we are passionate about. If you would like us to do a licensing audit, please email George@caltech.co.uk. We know that understanding the licensing of Dynamics 365 (CRM) is complicated, so please continue to read this page and find out how we can help you! Case management is now included in Dynamics 365 Sales Professional and Sales Enterprise application. A user that carries out a ‘fuller role’ and needs access to all parts of the system may look at a plan option. The plans combine all the applications. Team members are a light user. These light users are an affordable way of giving access to data at a much lower price point. The Enterprise Plan 1 (Customer Engagement Plan) includes sales, customer service, project automation and field service applications. If a user requires more than one application then it will be more affordable and best value to purchase the Plan, rather than separate applications. Until the end of March 2018, there were SMB Dynamics 365 licenses. If you selected these licenses for your business prior to March 2018 then on your 12-month anniversary date, these will transition. In March 2018 Microsoft removed the SMB license for Dynamics 365 and launched a Professional Sales license. This means there are now 2 sales applications. One is called the Professional Sales License and the other is called the Enterprise Sales Application. Dynamics 365 Financials was removed by Microsoft in March 2018. This is now called Business Central and it contains more functionality than the Financials product. Where can I get Microsoft Dynamics CRM Licensing? To get CRM licenses you can contact Caltech IT Limited who can supply them for its hosted clients otherwise if you are on-premise or Online with Microsoft, the Microsoft Dynamics CRM Licensing is now covered by Microsoft Dynamics 365. The CRM name was removed from the Microsoft Dynamics CRM product in October 2016. The product is now called Microsoft Dynamics 365 and the licenses for CRM can be purchased under this product name. You will experience a transition to Dynamics 365. For more information about transitioning from Dynamics CRM to Dynamics 365 click here. What changed from Microsoft Dynamics CRM when it moved to Dynamics 365? When the product transitioned to Dynamics 365 from Microsoft Dynamics CRM in October 2016, a new licensing structure was released. This meant that users typically purchased a Dynamics CRM Professional, Basic or Essential license but from October 2016 this changed and the licenses became role-based. The Dynamics CRM Professional, Basic and Essential licenses were replaced with applications; namely Sales, Customer Service and Plans. This blog post gives more information about the change from Microsoft Dynamics CRM to Dynamics 365. Where can I download the current licensing guide for Microsoft Dynamics 365? 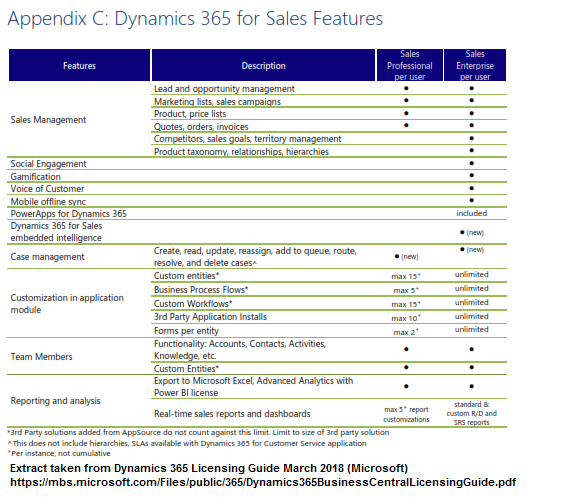 Click here to see the Microsoft Dynamics 365 Licensing Guide (March 2018). This way to Microsoft. What are the license options available for Microsoft Dynamics 365? You can purchase Microsoft Dynamics 365 on-premise, online or via SPLA (Hosted). The on-premise licensing means that you would have a server on site and you would purchase licenses and renew software assurance every 2 years. If you are already on-premise and want to move to the cloud, an option to do this is via dual use rights. Purchasing Online means that you are always on the latest edition. This is often referred to as cloud licensing. Another option is hosted by a value-added reseller. Caltech offers hosting of Dynamics CRM. What are the different applications available in Dynamics 365 licensing? What is the difference between a Sales Enterprise Application and the Sales Professional Application in Dynamics 365 licenses? The Sales Professional application was launched in March 2018 and allows basic sales functionality in Dynamics 365 as well as case management. The Sales Enterprise Application has full sales automation functionality as well as case management. The biggest difference between the Sales Professional Application and the Sales Enterprise Application is the fact that ‘goals’ can only be managed by a Sales Enterprise Application. Also, note that the customisation of the Sales Professional Application is reduced in comparison to the Sales Enterprise Application. Please see the image below which demonstrates the differences between the 2 sales applications. The Sales Professional license also does not contain a non-production instance (sandbox) however Caltech can ensure that you always work in a sandbox for testing purposes. What is a Goal in Dynamics 365 / CRM? Are goals included in the Sales Professional License? “Goals” were introduced in Microsoft Dynamics CRM 2011, and they provide a powerful toolset for monitoring progress against business KPI targets across all areas of CRM / Dynamics 365. Goals are an excellent way to track sales teams / individual sales commissions. The Goals feature is not included in the Sales Professional License. Goals can be found in the Sales Enterprise Application in Dynamics 365 or in the Plans. What functionality is included in the Dynamics 365 Customer Engagement Plan application? The Dynamics 365 Customer Engagement Plan license is a combination of applications available from Dynamics 365. The Dynamics 365 Customer Engagement Plan is sometimes referred to as plan 1, and its functionality includes the following applications; Sales, Customer Service, Field Service, Project Service Automation and Marketing (2k contacts). It also includes the Power apps and the mobile application platform service. If you need more than one application in Dynamics 365 then you will find this is a cost-effective way to license Dynamics 365 as it gives full access across the entire CRM site. Which Dynamics 365 License do I need for Custom Entities? Custom entities in Dynamics 365 are created to enable a process or a bespoke requirement a within your system. Users will still require a Dynamics 365 license to work within a custom entity. For example, if the entity dovetails into the ‘accounts’ entity (area in Dynamics 365) then the license will need to cover the work that is carried out in accounts. Therefore, please note that custom entities will require an appropriate license as customisations can only be made against the entities included in the use rights. Another note on custom entities; you must not replicate an out of the box entity using a custom entity. If you need some help on creating, planning or architecting custom entities please email george@caltech.co.uk. Is there a license for the Dynamics 365 marketing application? The Dynamics 365 marketing application is due during 2018. For marketing functionality already available within the core product please see my earlier blog. There are also digital marketing automation solutions available such as Click Dimensions. The Dynamics 365 License for Marketing is due for release during 2018. Can users share Dynamics 365 licenses? Dynamics 365 licenses are purchased per user. Each license is called a CAL and is named against each user. Device licenses give the ability to share a Dynamics 365 license but these users must use one device. The Device CALs are perfect for 24 / 7 operations such as large call centres with shift workers. What happens if I go over the storage for my Dynamics 365 site? If your Dynamics 365 site grows substantially and you reach the maximum limit, there is a license for extra storage. You can purchase more storage for your Dynamics 365 site. Here at Caltech IT Ltd we would recommend that you ensure that your site is cleaned and we can offer document stripping as well as SharePoint integration which will help manage your site size. What is the cost of Dynamics 365 licenses? Charity Prices differ. See our not for profit page for up to date information. What is the price of Dynamics 365 Licenses for Charities and Not for Profits? If you are eligible to receive not for profit / charitable licensing please see our specific charity page for up to date pricing. What is a team member license in Dynamics 365? A team member license provides basic access to Dynamics 365. A team member may consume data, use reporting of data or carry out light access duties. For more information on team member licensing see my full post. This business is completely new to Dynamics 365 and is looking for an online cloud-based CRM platform for 23 salespeople. The sales team need to manage leads and opportunities and create quick marketing campaigns to send out messages using the system. They want to keep the CRM fairly basic and don’t want to include social integration. They want to have a few custom entities where they want to add bespoke processes into CRM. They also require automation and will need about 10 workflows. The business also has 5 other users that don’t manage sales ‘opportunities’, but need to see accounts and contacts and perhaps update them, as well as writing notes in the CRM solution. 23 x Dynamics 365 for Sales app Sales Professional user. This would be the best licensing solution for the 23 sales team users would have access to the system to carry out their role focusing on sales. The 5 Team Members will be able to review open opportunities, have access to user reporting and dashboards and also be able to read all data on the site, as well as being able to write to accounts, contacts, activities, notes and tasks. If this is the best situation for your business by choosing the sales professional product codes instead of the enterprise pricing means that this scenario has saved over £6k! This company has a sales team of 26 people based throughout the UK. It also has 10 people that are based in the office managing customer service duties logging customer cases, as well as 3 managers that need to be able to report on sales and customer service activities but don’t do the role of the sales or service teams. They want the CRM system to follow their processes but are aiming to keep the automation to a minimum. They are developing less than 10 custom entities, but they do want to use goals and clever reporting. This would be the best scenario for this sales and customer service focused business. This gives all users the functionality of sales and customer service, however, if you wanted the sales people to only see ‘sales functionality’ we can make their sign in bespoke so that they only see that part of the system and vice versa for customer service. The 3 managers would be able to report on business activities. If this is the best situation for your business, by choosing this Sales Professional product code instead of the enterprise sales pricing offers a saving in this case in the region of £10k. 25 Salespeople will require a Dynamics 365 Enterprise Plan as they are working with Sales and elements of Customer Service as they are working with contracts. 30 Sales Enterprise Licenses – as this company will have more than 15 custom entities and more than 15 workflows. The 5 project managers will be able to use the Sales Enterprise Licensing as they will need to manage opportunities. The management team will be able to use team member licensing for basic reporting. Situation 4 – already using Dynamics CRM and are transitioning to Dynamics 365?